Best Cleveland Indians bar in NYC. Come watch playoff baseball with us! Watch every Cleveland Indians 2017 Playoff game at the largest Cleveland Indians bar in New York City: Brother Jimmy’s Union Square, 116 E. 16th St, home of the Union Square Browns Backers of NYC. Otherwise it’s first come, first served. But don’t worry, we’ve got lots of room at the bar and tons of standing room. 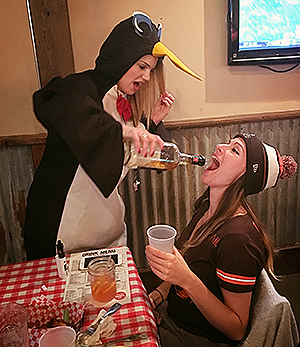 We are the largest and best Cleveland Indians bar in NYC, with CLE-only specials, Hot Dog Races in the middle of the 6th inning and plenty of hi-jinks from our famous shot penguin. All our normal Cleveland food and drink specials will be available during Tribe games: half price wings & rib-tips, $3 Coors Light drafts, $12 Coors Light pitchers, $4 Blue Moon drafts, $16 Blue Moon pitchers. Be sure to follow us on Facebook, Instagram and Twitter for updates throughout the Indians’ October playoff run. We’ve worked with the Yankees to set aside discounted Cleveland Indians tickets for ALL three games during their series on August 28, 29 and 30th in New York City. Tickets are already discounted from face value and much lower than prices on StubHub and Ticketmaster (by almost 50%). Don’t miss your chance to snag cheap tickets plus the opportunity to sit with all your fellow Union Square Browns Backers and other CLE fans during the only series where the Tribe visit the Bronx this season.